When you need a commercial sink but space is an issue, our 1 compartment sinks are the perfect products for you. Choose from our wide variety of 1 compartment sinks to find the perfect unit for washing, rinsing, and sanitizing pots, pans, dinnerware, or hands. Whether you need a drainboard model or a stainless steel utility unit with a prep basin, we've got the model for you. Our 1 compartment sinks feature corrosion-resistant stainless steel units with basket strainers, rounded corners for easy cleaning, and adjustable feet to put the sink at your desired height. Options also include models with one or two drainboards to stack clean dishes, pots, pans, and kitchen utensils. A dump sink and waste chute allow for the disposal of trash and other debris for more efficient cleaning. Choose a convenient commercial utility sink with features like rolled edges to contain splashes, swirl drains for better water drainage, and drilled holes to accommodate faucet installation. 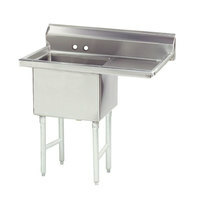 Advance Tabco 9-41-24-36RL Super Saver One Compartment Pot Sink with Two Drainboards - 98"
Good - The Advance Tabco 9-41-24-36RL Super Saver 98" one compartment pot sink is made of 18 gauge 304 stainless steel for durability and a professional appearance. Complete with a 12" deep bowl, an 8" backsplash, and (2) 36" drainboards, this pot sink features welded stainless steel cross-bracing on the sides for stability. 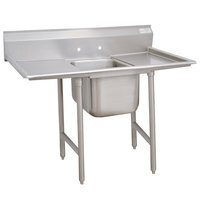 Advance Tabco 93-41-24-36RL Regaline One Compartment Stainless Steel Sink with Two Drainboards - 98"
Better - The Advance Tabco 93-41-24-36RL Regaline 98" one compartment pot sink is made of 16 gauge 304 stainless steel for increased durability and a professional appearance. Complete with a 12" deep bowl, an 8" backsplash, and (2) 36" drainboards, this pot sink features welded stainless steel cross-bracing on the sides for stability. 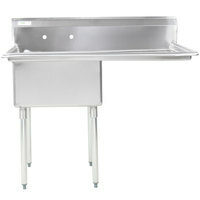 Advance Tabco 94-41-24-36RL Spec Line One Compartment Pot Sink with Two Drainboards - 98"
Best - The Advance Tabco 94-41-24-36RL Spec-Line 98" one compartment pot sink is made of 14 gauge 304 stainless steel for enhanced durability and a heavy-duty professional appearance. Complete with a 14" deep bowl, an 11" backsplash, and (2) 36" drainboards, this pot sink features welded stainless steel cross-bracing on the front, rear, and sides for increased stability. 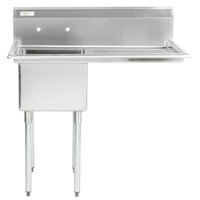 Good - The Advance Tabco FC-1-2424-24RL 72" one compartment fabricated sink is great for dish washing applications! Made of 16 gauge stainless steel, the sink bowl comes with 2 drainboards and is built to resist corrosion and last a long time in commercial settings. 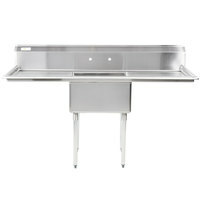 Advance Tabco FS-1-2424-24RL Spec Line Fabricated One Compartment Pot Sink with Two Drainboards - 72"
Best - Boating durable 14 gauge stainless steel sink bowls, this Advance Tabco FS-1-2424-24RL Spec Line 72" one compartment fabricated pot sink comes with 2 drainboards and is made to perform under high-volume commercial use. It features a continuous apron design that covers the outside of the bowl, ensuring optimal durability! 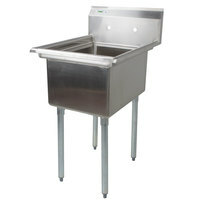 Good - The Advance Tabco FC-1-1818-X 23" one compartment fabricated sink is great for dish washing applications! Made of 16 gauge stainless steel, the sink bowl is built to resist corrosion and last a long time in commercial settings. Best - Boasting durable 14 gauge stainless steel sink bowls, this Advance Tabco FS-1-1818 Spec Line 23" one compartment fabricated pot sink is made to perform under high-volume commercial use. It features a continuous apron design that covers the outside of the bowl, ensuring optimal durability! 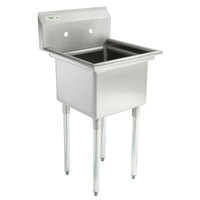 Good - The Advance Tabco FC-1-1824 23" one compartment fabricated sink is great for dish washing applications! Made of 16 gauge stainless steel, it features welded seams and cross bracing for long-lasting use in commercial settings. Best - Boasting durable 14 gauge stainless steel construction, this Advance Tabco FS-1-1824 Spec Line 23" one compartment fabricated pot sink is made to perform under high-volume commercial use. It features a continuous apron design that covers the outside of the bowl, ensuring optimal durability! Advance Tabco FC-1-2424 One Compartment Stainless Steel Commercial Sink - 29"
Good - The Advance Tabco FC-1-2424 29" one compartment fabricated sink is great for dish washing applications! Made of 16 gauge stainless steel, it features welded seams and cross bracing for long-lasting use in commercial settings. Best - Boasting durable 14 gauge stainless steel construction, this Advance Tabco FS-1-2424 Spec Line 29" one compartment fabricated pot sink is made to perform under high-volume commercial use. It features a continuous apron design that covers the outside of the bowl, ensuring optimal durability! 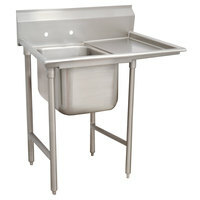 Advance Tabco 9-1-24 Super Saver One Compartment Pot Sink - 25"
Good - The Advance Tabco 9-1-24 Super Saver 25" one compartment pot sink is made of 18 gauge 304 stainless steel for durability and a professional appearance. Complete with a 12" deep bowl and 8" backsplash, this pot sink features welded stainless steel cross-bracing on the sides for stability. Advance Tabco 93-1-24 Regaline One Compartment Stainless Steel Sink - 25"
Better - The Advance Tabco 93-1-24 Regaline 25" one compartment pot sink is made of 16 gauge 304 stainless steel for increased durability and a professional appearance. Complete with a 12" deep bowl and 8" backsplash, this pot sink features welded stainless steel cross-bracing on the sides for stability. 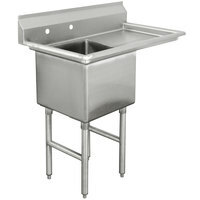 Best - The Advance Tabco 94-1-24 Spec-Line 25" one compartment pot sink is made of 14 gauge 304 stainless steel for enhanced durability and a heavy-duty professional appearance. Complete with a 14" deep bowl and 11" backsplash, this pot sink features welded stainless steel cross-bracing on the front, rear, and sides for increased stability. 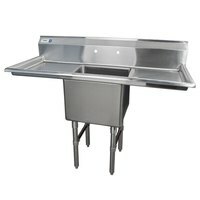 Advance Tabco 9-1-24-18RL Super Saver One Compartment Pot Sink with Two Drainboards - 54"
Good - The Advance Tabco 9-1-24-18RL Super Saver 54" one compartment pot sink is made of 18 gauge 304 stainless steel for durability and a professional appearance. Complete with a 12" deep bowl, 8" backsplash, and 2 drainboards, this pot sink features welded stainless steel cross-bracing on the sides for stability. Advance Tabco 93-1-24-18RL Regaline One Compartment Stainless Steel Sink with Two Drainboards - 54"
Better - The Advance Tabco 93-1-24-18RL Regaline 54" one compartment pot sink is made of 16 gauge 304 stainless steel for increased durability and a professional appearance. Complete with a 12" deep bowl, 8" backsplash, and 2 drainboards, this pot sink features welded stainless steel cross-bracing on the sides for stability. 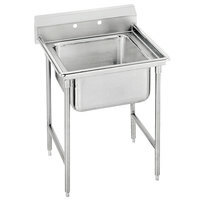 Best - The Advance Tabco 94-1-24-18RL Spec-Line 54" one compartment pot sink is made of 14 gauge 304 stainless steel for enhanced durability and a heavy-duty professional appearance. Complete with a 14" deep bowl, 11" backsplash, and 2 drainboards, this pot sink features welded stainless steel cross-bracing on the front, rear, and sides for increased stability. 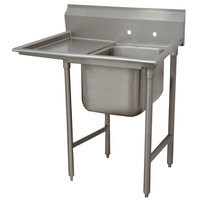 Advance Tabco 9-1-24-24RL Super Saver One Compartment Pot Sink with Two Drainboards - 66"
Good - The Advance Tabco 9-1-24-24RL Super Saver 66" one compartment pot sink is made of 18 gauge 304 stainless steel for durability and a professional appearance. Complete with a 12" deep bowl, 8" backsplash, and (2) 24" drainboards, this pot sink features welded stainless steel cross-bracing on the sides for stability. 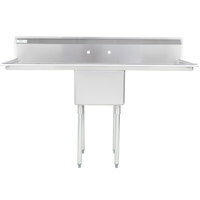 Advance Tabco 93-1-24-24RL Regaline One Compartment Stainless Steel Sink with Two Drainboards - 66"
Better - The Advance Tabco 93-1-24-24RL Regaline 66" one compartment pot sink is made of 16 gauge 304 stainless steel for increased durability and a professional appearance. Complete with a 12" deep bowl, 8" backsplash, and (2) 24" drainboards, this pot sink features welded stainless steel cross-bracing on the sides for stability. 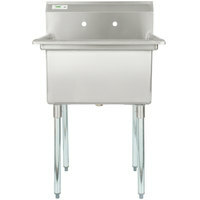 Advance Tabco 94-1-24-24RL Spec Line One Compartment Pot Sink with Two Drainboards - 66"
Best - The Advance Tabco 94-1-24-24RL Spec-Line 66" one compartment pot sink is made of 14 gauge 304 stainless steel for enhanced durability and a heavy-duty professional appearance. Complete with a 14" deep bowl, 11" backsplash, and (2) 24" drainboards, this pot sink features welded stainless steel cross-bracing on the front, rear, and sides for increased stability. 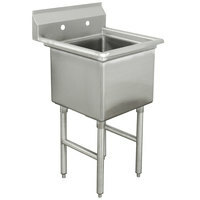 Good - The Advance Tabco 9-1-24-36RL Super Saver 90" one compartment pot sink is made of 18 gauge 304 stainless steel for durability and a professional appearance. Complete with a 12" deep bowl, 8" backsplash, and (2) 36" drainboards, this pot sink features welded stainless steel cross-bracing on the sides for stability. 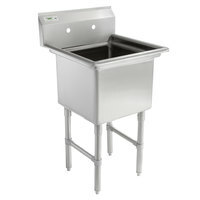 Better - The Advance Tabco 93-1-24-36RL Regaline 90" one compartment pot sink is made of 16 gauge 304 stainless steel for increased durability and a professional appearance. Complete with a 12" deep bowl, 8" backsplash, and (2) 36" drainboards, this pot sink features welded stainless steel cross-bracing on the sides for stability. 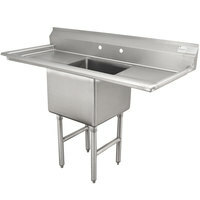 Advance Tabco 94-1-24-36RL Spec Line One Compartment Pot Sink with Two Drainboards - 90"
Best - The Advance Tabco 94-1-24-36RL Spec-Line 90" one compartment pot sink is made of 14 gauge 304 stainless steel for enhanced durability and a heavy-duty professional appearance. Complete with a 14" deep bowl, 11" backsplash, and (2) 36" drainboards, this pot sink features welded stainless steel cross-bracing on the front, rear, and sides for increased stability. 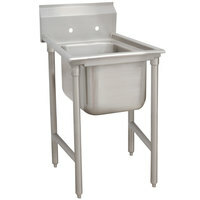 Advance Tabco 9-21-20 Super Saver One Compartment Pot Sink - 29"
Good - The Advance Tabco 9-21-20 Super Saver 29" one compartment pot sink is made of 18 gauge 304 stainless steel for durability and a professional appearance. Complete with a 12" deep bowl and 8" backsplash, this pot sink features welded stainless steel cross-bracing on the sides for stability. Better - The Advance Tabco 93-21-20 Regaline 29" one compartment pot sink is made of 16 gauge 304 stainless steel for increased durability and a professional appearance. Complete with a 12" deep bowl and 8" backsplash, this pot sink features welded stainless steel cross-bracing on the sides for stability. 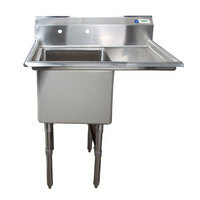 Advance Tabco 94-21-20 Spec Line One Compartment Pot Sink - 29"
Best - The Advance Tabco 94-21-20 Spec-Line 29" one compartment pot sink is made of 14 gauge 304 stainless steel for enhanced durability and a heavy-duty professional appearance. Complete with a 14" deep bowl and 11" backsplash, this pot sink features welded stainless steel cross-bracing on the front, rear, and sides for increased stability.